Tecno F7 Phantom A Plus is an upgrade to the original Phantom A (F7). The Tecno F7 Phantom A Plus gets a more powerful processor and a more recent Jelly Bean version (Android 4.2, not v4.3).Without the processor and Android upgrade, the Tecno Phantom A Plus looks every bit like the Tecno F7. Tecno F7 Phantom A Plus came with a mere 1GHz dual-core processor, the Tecno Phantom A is coming with a lot more power, spotting a 1.2GHz quad-core processor. However, the RAM remains the same at 1GB. The andriod phone comes pre-loaded with Facebook, Twitter, and Asphalt 6 game with loads of Google Apps like GMail, Google+, Google Talk, YouTube all pre-installed and over 600,000 apps available for download at the Google Play Store, which by the way also comes pre-installed in the device. Tecno F7 Phantom A Plus features the same display and camera as the original Phantom A. It features a brilliant 5.0-inch display with half HD resolution (720 x 1280 pixels). 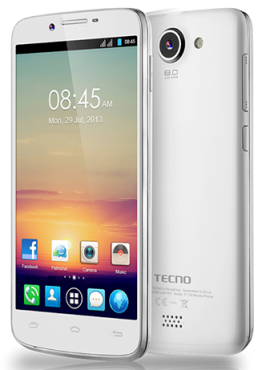 Tecno Phantom A Plus comes with an 8 megapixels camera, with LED flash. A front-facing 1.2 MP camera for videocalling is also provided. Where to Buy Tecno F7 Phantom A Plus in Nigeria.You can buy This smartphone at stores near you. The Price of Tecno Phantom A Plus price in Nigeria ranges from N36,000 to N40,000 depending on your location in Nigeria. You can buy online or at a phone store near you.